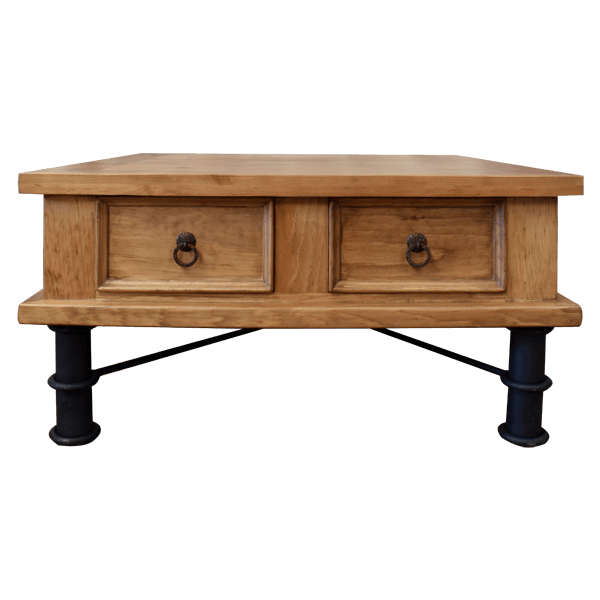 This handcrafted, Western style coffee table has a lovely, light finish which enhances the beautiful, natural grain of its wood. The coffee table has a wide, rectangular top, and the design of its straight, clean top rim is repeated below its twin drawers. Directly below the table top are two, vertical, rectangular drawers, and centered in each drawer is a hand forged, iron, pull ring. The top of the coffee table rest on four hand forged, iron supports adorned with decorative, iron rings. The legs are joined by a hand forged ¨X¨ stretcher, with a knot design in its center. The top of the coffee table and its drawers are all made with the best, sustainable, solid wood available, and it is 100% customizable.